Where do you find support for mums? Have you heard of or do you remember Groovy Mums? We had Twitter parties, the mums who blogged shared their stories and most importantly, both myself and other mums made proactive and positive changes in their lives. It is amazing what you can do when you have a great peer support network behind you. 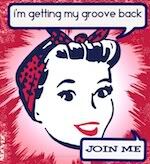 Groovy Mums is coming back with a new name and exciting ways to get involved. I think it is a splendid time to relaunch support for mums as children go off to school and mums might have a little more time to focus on their hopes and dreams. 1. Groovy Mums regularly got criticised for the name so there will be a new name. I do have a name in mind but I am also open to your suggestions too before next week’s post when we really get started on this amazing journey. 2. People will be able to get more involved by sharing their own stories about how have found themselves, carved out some me time or taken charge of their own destiny. 3. There will be a collaborative Pinterest board to share positive images of what we get up to. 4. A weekly linky will be opened on Thursdays will calls to action and inspirational ideas. 5. There will be a presence on other social media networks. 6. There will be a new badge and I am looking for a volunteer to design it. 7. There will be prizes and there will be certificates! 1. You can take part in the weekly linky telling us how you are getting on and/or seeking the support of other mums. If you can add images or video, so much the better. It is good if you can visit the other posts linked up as you can lend your support to other mums and might learn something new too. 2. You can take part in our regular Twitter parties to share your ideas and offer support for mums. 3. There are very exciting plans for the new and improved Groovy Mums in 2015 so now is the time to get involved to see what that might be all about. Are you on board to take baby steps to make your dreams come true whilst offering support for mums too? My mind’s gone blank for names but happy to join in & support! If you check out my page I set myself goals for the year under the 24 before 24 maybe this will inspire others. Please let me know what you think and if you want to talk a bit more I’m on twitter and my email is on my blog!!!!! This is just what I need right now along with a kick up the rear end to get me focused on my dreams and less feeling down in the dumps which is what I have been doing lately. Time for my pity party to end. I’m in, Groovy mums was great for me, and as 2014 has been difficult so far, I’m looking towards September for a new start and a new focus. No idea what you could call it, but will try and have a think. Sounds great-always interested in support and ideas sharing. Bit useless when it comes to name ideas though, sorry. I’m in lovely 🙂 does it start next week?